How to Garden › Winter Outlook: What Should Gardeners do to Prepare? 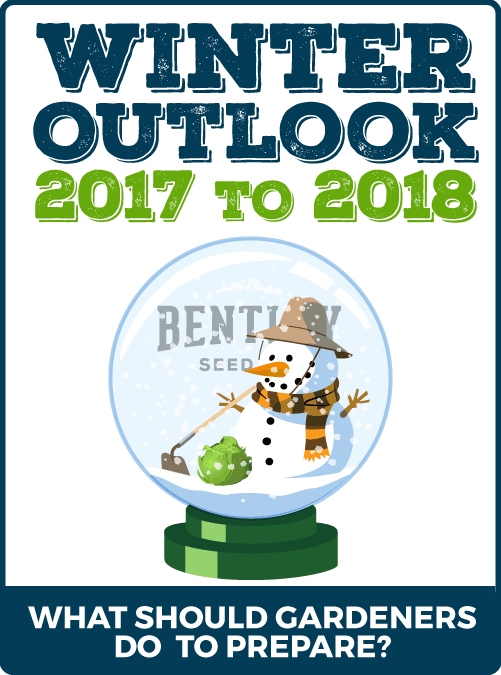 Winter Outlook: What Should Gardeners do to Prepare? As summer blossoms fade and the days become shorter, that means it’s time for gardeners to start preparing for the inevitable—WINTER. Depending on your point of view, and where you reside, you may or may not like the Farmers’ Almanac’s winter 2018 forecast for the U.S.: cold and wet for much of the country, except in California and its neighboring states. Apparently, those of us who inhabit the area between the Great Lakes and the Northeast should prepare for “snowier-than-normal conditions.” (Editor’s note: UGH.) So, what to do to prepare for winter—both in order to ensure the survival of your perennials, as well as the health of the soil in the garden beds to get a running start in spring when the time comes to sow new plants—and when? Some plants can remain: kale, cabbage, broccoli, brussels sprouts, cauliflower and radishes, vegetables in the brassica family that release cyanide compounds in early spring, killing off insect pests. And, speaking of compost, your soil will benefit from the addition of mature compost at this point, topped with a layer of fresh mulch in the form of shredded wood chips, straw or hay to protect it . Wait to apply mulch until it gets fairly cold outside, ensuring that unwanted critters, such as mice, have already found other cozy places to spend the winter. As for preparing your flower beds, once there has been a killing frost, pull up dead annuals and selectively cut back your perennials to 3”. Note that cutting these plants back too soon could compromise them by cutting off the foliage that feeds their roots. Leave the stalks of perennials with distinct seed heads intact, including black-eyed susans, coneflowers, and sunflowers—they provide visual interest to your garden in the bleakness of winter, but more importantly, they provide essential food and sanctuary to birds and butterflies. Renew the mulch in your flower beds to maintain a 2-3 inch layer over the root system. Let’s face it. Most gardeners dread the end of summer and the gradual (or not, depending on where you live) onset of winter. We like to be outside planting and growing things; you can’t do that in winter—that is if you live in the northern half of the country. Still, winter does offer a silver lining to gardeners: really cold temperatures kill the insect pests that overwinter in the soil. While that may be all well and good, here’s hoping the Farmers’ Almanac winter forecast is wrong.